There are some deaths that you hear about that hit you in a vulnerable spot sometimes more than others. It does not seem to matter if you knew the person or not. I had a moment like that when John Ritter died. To this day, I am not even sure why. After tweeting for hours about the injustice for Trayvon Martin, thinking about a child who died that did not have to die, news came in that a “Hollywood star” had died in Vancouver. Then it was rumored that it was the star of Glee, Cory Monteith. I watched the Vancouver Police Department’s live conference feed on their web site which confirmed this. It compounded the sadness of the day. Speculation arose that perhaps he died of a drug overdose since he had been battling these demons and went into rehab earlier this year. I pray that it was something else–maybe a brain aneurysm–maybe sudden cardiac death–anything else but drugs. An autopsy will be done today, Monday, July 15, 2013, although I do not know if they will necessarily have the results. Twitter was abuzz with tweets from people who knew him as a friend, knew him as a colleague, or people who met him at one time or another. His co-star Lea Michelle and he were in love with rumored speculation that they were engaged (although no statement had been released saying such). When he checked himself into rehab, she stated, “I love and support Cory and will stand by him through this. I am grateful and proud he made this decision.” Based on the Twitter response from those who were friends or worked with Cory, his behavior was quite the opposite of a typical person using drugs (self-centered, erratic mood swings, careless about grooming). Indeed every time you saw him in a public forum, he always emanated a light that surrounded his being, an aura that was unmistakable. Recently I saw him in a Masterchef episode where the contestants cooked for the cast of Glee. He was playful with them. He got to carry the flag for the team that won–the red team. You can watch the entire episode here. Long before Glee, I knew of him from the Stargate series (both Stargate SG-1) and Stargate Atlantis. He was not a big star then, but I noticed that the camera just loved him. There was something about him–something you could not quite put your finger on. 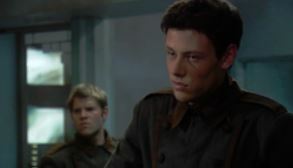 The character of Finn evolved into one of the more complex people on the show. When the writers put Finn on a course of becoming a teacher, you knew that perhaps they were grooming him to take over for Matthew Morrison’s character as the new teacher at William McKinley High School. The question will be how do they write these tragic circumstances into the Glee storyline? It has been renewed already for 2 additional seasons and I do not know how far in they are filming season 5 yet. There was going to be a long hiatus with a “creative twist” long before these tragic set of events unfolded. Is it better to just have the relationship end off screen for Finn and Rachel so Lea does not have to pour the real-life grief she is feeling into a scene where Finn suddenly dies on the series? Time will tell. In the meantime, we are left with that fact that someone so young and so vibrant, a talented young man who has had great success in his career, who was adored by so many around the world, tragically died. The cause of death does not matter. It does not change the fact that he is gone. The world has become less bright without him in it. Rest in Peace Cory. The world will miss you. This is a wonderful post about Cory Monteith. Awesome as always Hilda. Thanks for Re-blogging it Karen, what a good post. I for got he was in SG-1.. Thanks for the reminder Hilda. Sad story of loss. Thank you for reading it SilkenSoul and commenting. I like UR idea of Finn & Rachel parting off-screen It would be cruel & a bit ghoulish i think to do otherwise.